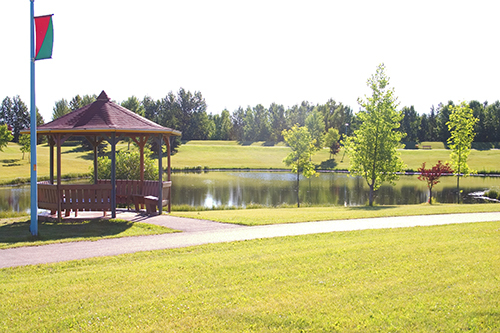 The Town of Drayton Valley is located 90 minutes southwest of Edmonton, Alberta, three hours northwest of Calgary and 70 minutes from the Edmonton International Airport. If you are driving from south Edmonton or the Edmonton International Airport, Drayton Valley can be reached by driving south on Highway 2 and turning west onto Highway 39 (the Drayton Valley/Leduc turn off). If you’re leaving westward from Edmonton, take Highway 16 (the Yellowhead Trail) and turn south onto Highway 22 (Entwistle/Drayton Valley turn off). From Calgary, either take Highway 2 north and turn west on Highway 39 or take the Trans Canada Highway (Highway 1) west and turn north on Highway 22 (The Cowboy Trail). Highway Map – Check out our maps page for more information. Canadian National Railways serves Evansburg, which is 41 km north of Drayton Valley. Highway 39 links Drayton Valley with Leduc. From there, connections can be made to Edmonton and Calgary via Highway 2. Highway 22 goes north to Entwistle and Mayerthorpe and it connects with the Yellowhead Highway (Highway 16). Highway 22 south goes to Rocky Mountain House and Crowsnest Pass. Highway 22 connects to the Trans-Canada Highway, as well. Drayton Valley is located 766.30 metres (2,750 feet) above sea level. The amount of hours of sunlight ranges from roughly 17 hours in summer to 7 hours in winter. The average temperature range in the summer is between 10°C and around 25°C. The average temperature range in the winter is from -16°C to -6°C. Every organization knows the difficulty of finding available funding. The Town is here to help you and your organization find those resources and get things moving.